After dreading this project for two months, I finally bit the bullet and tackled painting two rooms in my house. Am I the only one who dreads painting rooms? It’s one thing getting out the paint brushes for a chair or box, but to take everything off the wall, put drop cloths on the floor, move furniture, etc., etc., not my favorite thing to do. I was quite proud of myself for not getting much paint on the floor, but when I got out the oil-based paint for the woodwork, drip, drip, plop. It dripped like crazy every where!! I spent almost as much time scrubbing paint off the floor as I did painting. I painted my breakfast room, and the kitchen (I’ll show you later since I’m not done in there), and even with all of that hassle, I can honestly tell you, it was so worth it. Here’s a look at the before. The curtains came down, and the Sherwin Williams Bungalow gold walls were painted Bittersweet Stem, the woodwork, formally Bungalow Gold, was painted a creamy white. I also painted the chairs (click here) and changed out the artwork on the wall. This was a 3 piece print on canvas from Joss and Main. Then I purchased these lovely French tea towels, also from Joss and Main, and the best part is that they are actually made in France. This one hides our little secret. But I suspect you already guessed what was behind it. I also painted the wainscoting white; I’m amazed at how much bigger the room feels without the curtains, and with the white paint. Okay, the honest truth is that I painted 7 rooms in that Bungalow Gold color, can you believe it? 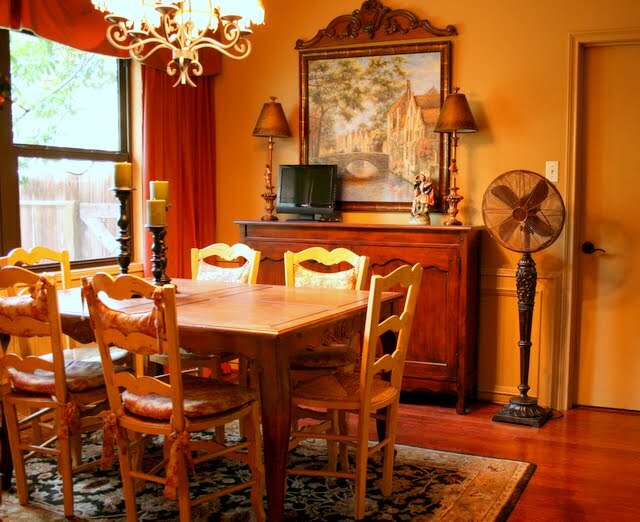 I never really liked the color except in the family room, where all of the natural light balanced all of the yellow. But why did I paint 7 rooms in my house this color? For the past few years I have been trying to get rid of this color. I’ve painted over the Bungalow Gold in my bathroom, and the kitchen and in the breakfast room. I still have the foyer, the upstairs hallway, the family room, and the laundry room left to paint. Hmmm, I will let you know how that goes, and if I do it myself or hire someone to do the rest of the painting. Here are the views toward the window and toward the brick wall in the breakfast room. Much calmer, don’t you think? I’m very pleased with the new look, but I am taking a break from painting now. I have lots of linen fabric sitting in my office, just waiting to be sewn into slipcovers for all of my living room furniture, so that’s my next project. I like to split things up so I sew, then paint, sew then paint. It keeps me from getting too tired of either one. But this week, I don’t have time for either. My kids start school next week, and I have to get some boring things done before I can start the slipcovers. My family apparently wants some edible food in the house, and I’ve got to get the tire to our mower fixed. Don’t they know I have a blog to run?? Anita, I love the changes! How beautiful and peaceful it looks and I love the brick wall. Seems like it the time to trade up gold walls for cream. Your refresh is luvly Anita. We are also repainting ( not a fan) trading the dark , and gold, for creamy white and lighter colours… the painting continues….. I really like the new paint color, and would have never guessed you had a tv under there. That is a fantastic idea. A M A Z I N G transformation!!! “Mr. Ed” won’t allow me to paint interior or exterior…says I’m “a sloppy painter”! He’s correct! However, I can do it twice as quickly and that’s with cleaning up my own mess!!! I just let him “Do HIS Thing”!!! I love the changed out art work and the cleaver way to hide the screen! Those candlesticks are stunning too!!! I’ll be back to see what you put up to those windows and to see the kitchen reveal. Now…go cook dinner for your family, dear friend! Watch their faces when you tell them it’s for your blog! Ha! Regena in TN. Beautiful! I have been putting off my bath for several months because of the same dislike of the nuts and bolts of getting ready. Your color choice is gorgeous! So much lighter and brighter and updated. Love that brick wall. They just add such great texture to a space. Yes, I hate having to paint walls, but I do. Only way it gets done. It looks so lovely and fresh and bright now! So pretty! It looks brighter and the brick wall is gorgeous. Painting the trim white was an excellent idea too. I used to, believe it or not, enjoy the painting process, but as the years kept coming, the old body kept resisting. Now, paining is on my list of things to dread. Having said that, your new color is totally wonderful! I wish I could summons the energy to paint a couple of bedrooms. Love the soft colors, so serene. Funny how things have gone back to a white or softer palate. Looks great! I agree it looks so much lighter.I too had allot of that gold color in my home.And when I painted my walls I felt like my house could breath again.It opens everything up.And you can do so much more with a lighter neutral background.Looks beautiful! I hate painting. Or maybe it’s the prep and clean up part? I’m not sure, but there is definitely something I hate about it! So light and bright. And I ADORE your brick wall. Is that a former outside wall? Well, apparently they do not realize that you have a blog to run! And we both know how much time it takes to run a blog. I hate painting. Just hate it. I’m terrible at it, which is probably why. And I WOULD NOT begin to tackle slip covers. Hope they don’t have to scrape you off those brick walls while you’re in the midst of that endeavor! You’re so funny! Seriously, I love your breakfast area! It was pretty before. I would have never guessed that painting would totally change the look of this room. Your French touches are wonderful! You’re very talented! It looks fabulous! And how clever you are, I did NOT know it was your computer screen. Super crafty idea. Love it. Anita the breakfast room looks wonderful.So fresh and pretty. I so need to get painting. I have the stairwell and upstairs hall to do and still the dining room. I am currently working on merchandising and displaying for the antique store I have a booth in (now 2) so it is keeping me pretty busy. I am having fun though! I totally agree about dreading painting a room. The worst part to me is the trim work. UGG! Experienced painters, I am sure, don’t need to put up tape, but I have to. I do love the end result, though. Your room was nice before, but it does look so much fresher now. Yes, I hate painting too. I would rather wallpaper than paint! Most of my home is log, so fortunately I don’t have to do either. What a transformation! I was a yellow/gold and red girl too! I call it my Tuscan phase! You must love spending time in your newly painted room! It is stunning and so inviting! Gorgeous! I do believe this blog will be apartment inspiration for me! Oh, I love your new look. All the light from the curtainless windows, bright new chair color and soft walls. Everything looks so fresh and revived. I love the new look. It is quite amazing the difference removing the curtains makes, it really opens up the room. Actually I liked the ‘before’ look too, but this lighter, fresher look seems to suit this room better. Families are so demanding aren’t they? Food indeed! OH Anita, it feels so light and airy now. Love it. gosh I love your house…I think you are very talented and the list is pretty short of people who paint themselves. I kind of like it, not sure why…relaxing? but your house looks great!!! I agree with everyone else! The room does look so much brighter now. Very, very nice. I had no idea what was behind the French linen. I just thought it was a very strange way to display it. :/ LOL!! I would not have guessed that there was a TV hiding under the cute tea towels. I love the fresh look the new paint gave the room. I need to paint a few rooms as well. I just keep putting it off. Can’t wait to see the other rooms and what color you paint them. Wow girl, what a difference. I love the new fresh look. I have to tell you, I have that same yellow/red poppy picture hanging over my bed. When we moved into this home the walls were all cream and the doors and woodwork all tan. Not a big fan. I love white. I decided to live with it for a while, but after 3 years I need my white. Told hubby that’s what I want for Christmas. I think I will hire it out. Lots of trim and doors. So much taping off. My old knees just aren’t up for the job.